Starting pitchers Hyun-Jin Ryu, Clayton Kershaw and Walker Buehler will be doing their part to advance the Dodgers’ cause while they play the Giants. With a magic number of five to clinch the NL West and three to clinch a spot in the NL Wild Card game, the Dodgers could still earn their usual three-day vacation before the NLDS begins Thursday. By the same token, the Dodgers can’t be eliminated from postseason play before Sunday’s scheduled regular season finale. and then a rescheduled Wild Card game on Wednesday. I mean, I want the Dodgers to take the simplest route into (and through) October, but man, can you imagine? With Ryu and Kershaw taking the mound Friday and Saturday, that could leave the Dodgers’ postseason fate in the hands of Buehler, the 24-year-old rookie who nonetheless might be the best person to handle the chore. Over his past 11 starts, with the exception of a respectable six-inning, four-run outing September 8 at Colorado, Buehler has held his opponent to two runs or less every time. He has a 1.70 ERA, 0.87 WHIP and 84 strikeouts in 68 2/3 innings over that stretch. Nevertheless, if a loss Sunday means elimination, Buehler would be making the highest-stakes regular-season start by a rookie in Dodger history. No other Dodger rookie has ever started a game on the final day of the regular season that might mean either playoffs or elimination. If you’re a Dodger fan of a certain age, you might be thinking that Fernando Valenuzela should have done so. Valenzuela, at least in people’s memories, is the popular choice to have started for the Dodgers in their winner-take-all NL West tiebreaker game against the Astros in 1980. However, as I write in 100 Things Dodgers Fans Should Know and Do Before They Die, Valenzuela had pitched two innings in relief both Friday and Sunday. At best, El Toro could have been the opener of what we now call a bullpen game, but not a starting pitcher for Game 163 in any meaningful sense. Instead, the Dodgers were left with Dave Goltz, a free-agent signee who had disappointed most of the year, but had shown a bit of upswing with a 2.56 ERA in September. Goltz, to put it mildly, did not succeed. If there’s a Game 163 this year, Rich Hill will be the starter, and while Hill is no Goltz, his 3.87 ERA (5.09 ERA in September) might invite some tension, if not derision. Know that with 40-man rosters still available for the tiebreaker game, manager Dave Roberts’ hook can and probably would be quick. In any case, Hill would present a counterpart to Buehler by becoming the oldest pitcher to make a winner-take-all regular-season start in Dodger history. Now, let’s say the Dodgers and Rockies finish 162 games with the same record as the Cardinals — which would happen if the Cardinals gained two games on the Rockies over the next 72 hours and the Dodgers gained one. In that scenario, if the Dodgers lose the division tiebreaker Monday, they would face off in a Wild Card tiebreaker at St. Louis on Tuesday. And that’s where the choices really get interesting. 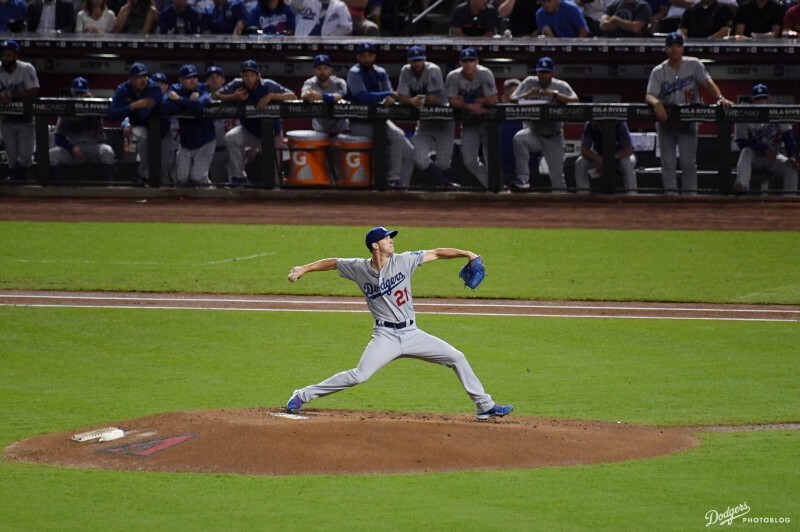 It would be Ross Stripling’s turn in the rotation, and if not him, then Alex Wood. But Stripling made a disastrous start Wednesday at Arizona, the worst by a Dodger since Wood’s last start, September 10 at Cincinnati. Neither would inspire more confidence than … oh, let me pick someone at random .. Yu Darvish for Game 7 of the 2017 World Series. Before Game 7 began, I fully understood the case for starting Kershaw and didn’t particularly disagree with it, but nor have I ever second-guessed the decision to open the game with Darvish, who after all had successful outings in the two previous playoff rounds. As bad as Darvish looked in Game 3, it struck me as aberrative. It didn’t make sense to assume he would do worse on four days’ rest than Kershaw on two days’ rest — and since Kershaw wasn’t going to go the distance in any circumstance, why not use the experience he had picked up coming out of the bullpen in the 2016 NLCS to your advantage? My guess is that Ryu would be left to stay on rotation for the Wild Card game, with Tuesday’s Wild Card tiebreaker game involving the rest of the staff — with Wood, Stripling or maybe even Kershaw in reserve for a couple innings, as much as you’d like to preserve him for a potential NLDS Game 1. But let me throw one more name out at you, one that would have the potential of lifting the Dodgers into the playoffs after the most brutal final week imaginable, while also exorcising a few ghosts of October 6, 1980. Julio Urías, 22, has pitched three major-league innings in the past 16 months. His longest outing is 29 pitches, and there’s no way he’ll throw much more than that in a game this October, no matter the stakes.